Just wanted to throw this one up there for fun. On October 9th at Lighthouse Pt in New Haven, CT this presumed Common Nighthawk made two passes through the park. It's getting late for CONI here, but definitely not too late. There are often lingerers into October. But still, I studied the bird with vagrants on the mind. One feature to look for on Lesser Nighthawk (very rare vagrant this far northeast of its breeding range) is a more rounded wingtip on average, caused by p10 being shorter than p9. 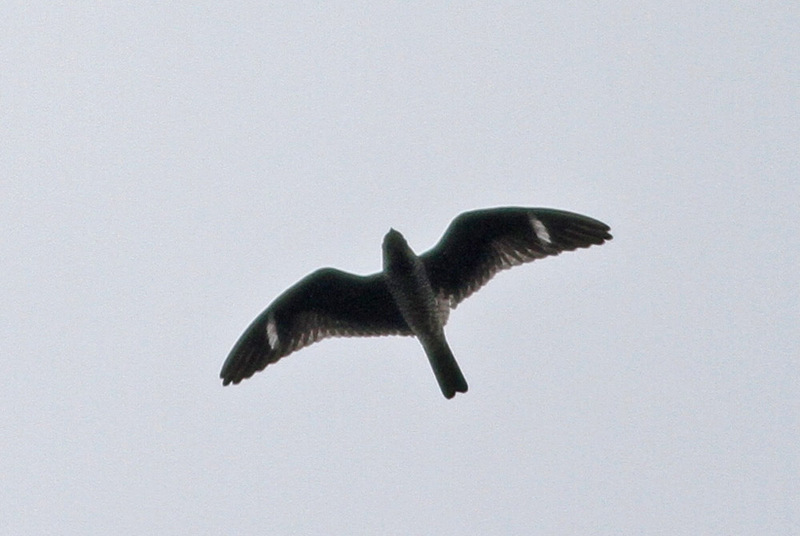 However, Common Nighthawks can show p10 slightly shorter than p9. This individual happened to have a particularly short p10...shorter than I have ever noticed on one. It's likely within the variation of CONI though, since everything else about this bird seems just fine for Common, including the more proximal position of white wing patch.